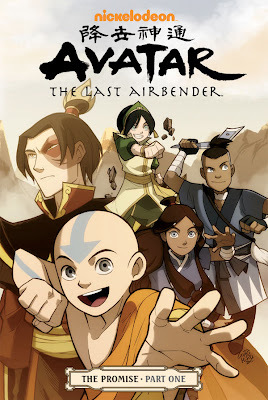 After 3 seasons of following the adventures of Aang, Katara, Sokka, and Toph across the four kingdoms of Water, Earth, Fire, and Air, fans will finally get to see what happens after the series ends. In Avatar: The Last Airbender - The Promise Part 1, we pick up immediately after the end of the series to find our heroes along side Fire King Zuko and Earth King Kuei deciding how best to handle the removal of the Fire Nation colonies. It's decided that The Harmony Restoration Movement, named by Sokka of course, will uproot and move all the Fire Nation colonists back to their homeland in the Fire nation and out of the Earth Nation territory. A fine idea to be sure but it's soon realized some things are not as easy as they seem and Aang must learn if he can bring peace to the Movement as well as keep a difficult promise to a friend. The book contains the usual hi jinks of course, coupled with the its ability to tackle big social and economic issues much like the show did. It keeps things simple at first, then offers up real solutions that are not always as simple to handle and put into action as they seem. What I like most is you get to see what happens after the war. Don't get me wrong I love being left with the whole Happy Ever After feeling, but I also know that the end of a centuries long battle can leave some serious wounds on the world. It's fun to watch the characters I love deal with these issues in their own unique and charismatic way. What I also loved were the cameos of a number of fellow friends from the series scattered throughout the story. I'm really looking forward to seeing if more show up in the coming issues. I also wanted to note that this series will help tie in the new cartoon coming out on Nickelodeon. Yes another Avatar cartoon! I know, try to remain calm. Writer, Gene Luen Yang, and artist, Gurihiru, do a wonderful of job of keeping true to the characters, story, and original art of the series. No detail was overlooked in the creation of this novel by Dark Horse, there's a movement to the panels. Almost like actual action taking place, as though the panels themselves will play the story out and I won't have a need to turn the page to find what's next. My only two complaints is having to wait till May for the next installment and the famed Cabbage Cart Vendor was absent from the cast. The wait I can get over, I've waited this long for the series to begin anew, and maybe the Cabbage guy will be in the next issue. Fingers crossed.